For higher volume waste producers/recyclers, the semi-automatic horizontal balers within our range are a popular choice. Promising greater throughputs with less manual input, the machines are extremely flexible, offering varied in-feed methods, a wide range of recycling capabilities and heavy bale weights with minimal cycle times. Ideal for handling multiple dry recyclables including cardboard, paper and plastic film, the RWM HZ50T is supplied with ‘magic eyes’ which automatically start and stop the compaction cycle for operational efficiency. To download the brochure, please fill in your details in the form below. The RWM HZ50T is one of the most competitively priced horizontal balers in the UK marketplace, and also one of the most impressive in terms of the features it has to offer. From simple considerations such as the orientation of the baler, location of the control panel and configuration of the door hinges, it is designed to completely fulfill the specific needs of the recycler. No compromise required! This machine is also built with efficiency in mind, which is why the tying off of the resulting bale is the only manual process involved with operating this machine. 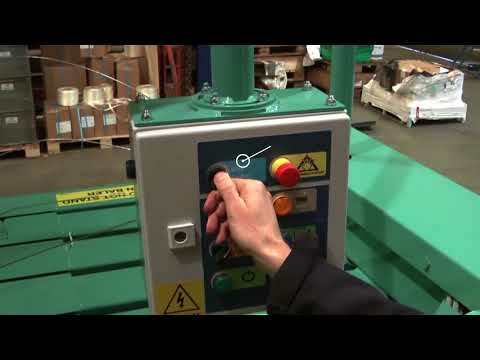 An integrated wire pusher even threads your baling wire for a quick and easy finish!